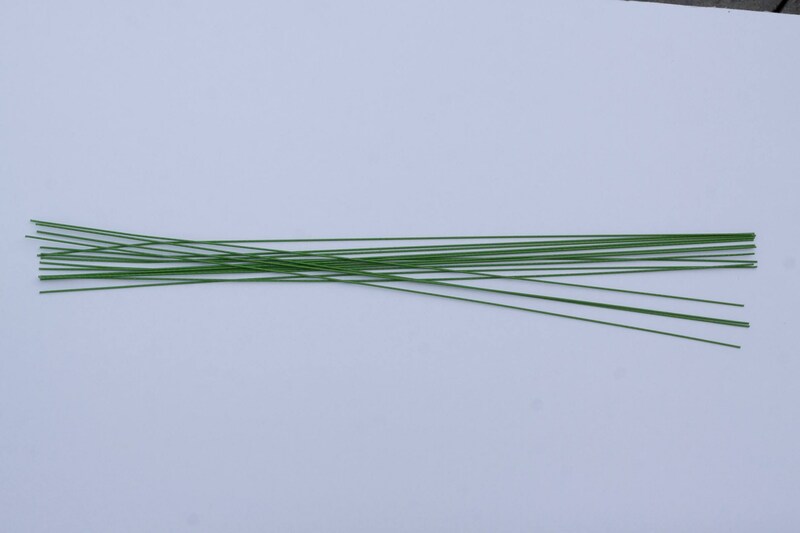 Green cloth covered stem wire. All these options are easy to bend and easy to cut with a wire cutters. We use these four gages in all our own designs with sola flowers. 16 gage / 18 inches long / 8 pieces per package - great for using with sola flowers when inserting into foam bricks. This is the thickest wire we offer. 18 gage / 18 inches long / 12 pieces per package - great for using with sola flowers when inserting into foam bricks and hand tied bouquets. 20 gage / 18 inches long / 15 pieces per package - great for making hand tied arrangements such as bridesmaid bouquets, bridal bouquets and vase arrangements. Works well for corsages and boutonnieres too. 22 gage / 18 inches long / 20 pieces per package - perfect for pin on corsages and boutonnieres. This is the thinnest gage wire we offer. HAVEN'T USED THEM YET BUT THEY LOOK LIKE EXACTLY WHAT I WANTED. VERY WELL MADE!! SHIPPING WAS VERY FAST!! Excellent quality! Fast shipping. Thanks! Nice straight wires packaged nicely.